Charlie Murder is the newest release from developer Ska Studios--the same company that brought the world The Dishwasher video game series. 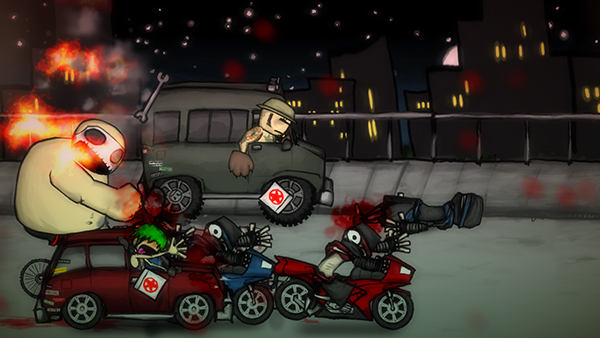 Charlie Murder takes noticeable inspirations from its predecessors but features an all new storyline based around a punk rock band and their battles against undead hordes of enemies and a rival band. The game features a unique art design and combo filled combat that works together well with a campaign full of heavy metal inspirations. Players can team up in Charlie Murder with multiplayer sessions for up to four players to experience a fun game that is a cut above the average side scrolling, beat 'em up title. Charlie Murder stars a punk rock band that shares a name with the title of the game. The game begins with characters battling against the forces of hell in the underworld, only to be revived shortly after to put the beatdown on a horde of nearby zombies. The insanity of the game only continues from there, as players learn more about the group and their past. The band will battle against the dark forces of their rival band known as Gore Quaffer in order to save the world and continue rocking. The game features five playable characters that each have their own respective place in the band and special attacks that come with their job title. Players will battle through waves of enemies on the way to end bosses and members of Gore Quaffer ala Scott Pilgrim vs. The World. The game has a unique storyline that isn't the most entertaining but does provide enough incentive to see the game through to the end. Combat in Charlie Murder is very much a side-scrolling, beat 'em up, and many of the elements that make up the genre are present in the new game. Mixtures of light and heavy attacks create combos that deals the main damage to enemies, while there are plenty of equippable items in the world that make good weapons to take out monsters as well. Killing enemies nets experience points, or followers on a social network as they are known in the game, that allow players to unlock new skills and gain statistical boosts. Attaining tattoos is also a good way to gain some buffs in battle, and players have a large inventory of items that can replenish health and provide other helpful effects. For the most part, Charlie Murder is a by the book game for the genre that doesn't offer anything innovative or terribly exciting in combat but is still fun for fans of this type of game at the same time. Though the game's combat is fairly repetitive, there are some truly unique aspects to Charlie Murder. Most of the gameplay outside of combat revolves around the player's smartphone. The phone can be accessed at anytime throughout the game to check helpful messages and gameplay tutorials, level up characters and choose new skills, check the character's current level and number of followers and even snap some quick pictures of QR codes hidden in the map for some nice in-game rewards. The messaging system on the phone also helps progress the characters and storyline with many explicative filled texts coming from rival members of Gore Quaffer while killing their numerous minions. There are also some mini-games scattered throughout the game to mix up the action with skateboarding or Guitar Hero like rhythm and timing sections. Charlie Murder definitely includes some unique features even if the game isn't always incredibly diverse from other games in the genre. One of the selling points of Charlie Murder will likely be its unique aesthetic. The game instantly reminds players of Ska Studios' other hit series, The Dishwasher, though the two games' storylines are nothing alike. Dimly lit and foggy environments, dark color palates and purposely sloppy character models make up the game, and character animations look good for the most part, and it helps create an appropriate atmosphere for a game as crazy as this one. As you'd expect, the game is filled with plenty of heavy hitting rock music and metal instrumentals, which isn't everyone's cup of tea, but the game's soundtrack is sure to resonate with its target audience. The game also controls good for the most part, though we wish there would have been a wider choice of attacks to unlock throughout the game. All in all, Charlie Murder is a fine game and a fun cooperative game that can be purchased in a decent price range. Unique graphics and a rocking soundtrack are the main attractions here, but there is some fun combat as well with RPG elements thrown in for good measure. Some of the game's tougher levels and boss battles will likely require some level grinding, and dying and restarting stages is annoying, but teaming up with other members of the band to battle foes is always a lot of fun. Charlie Murder doesn't revolutionize the genre, but it does offer hours of gameplay for a low price and provides publisher Microsoft Studios with another good release for their Summer of Arcade promotion. Download your copy of Charlie Murder exclusively on Xbox LIVE Arcade today and rock on players! 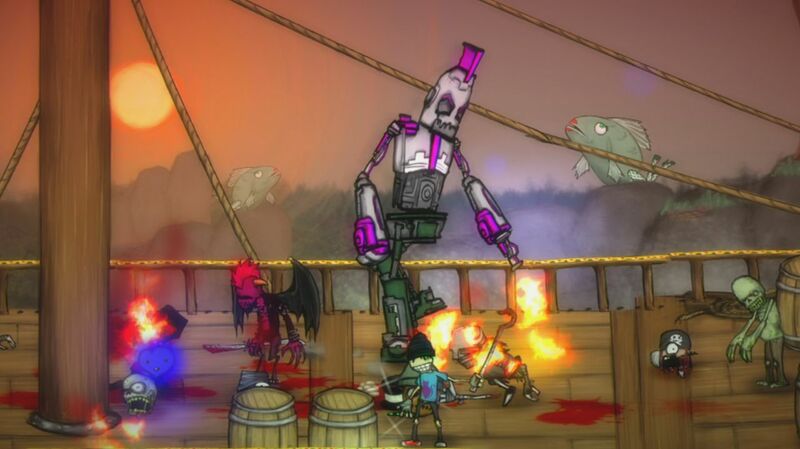 Charlie Murder is now available exclusively for Xbox LIVE Arcade and can be purchased for 800 Microsoft Points. 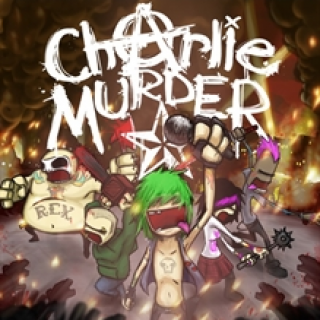 Charlie Murder is rated M by the ESRB for Blood and Gore, Violence & Use of Drugs and Alcohol. For more information on the game, check out the official Charlie Murder website.